I always root for the little guy, the unloved one that doesn't get all of the attention but can still do impressive things. This is what happens when you watch all of the episodes of The Newsroom over and over again. Judgement is pretty harsh in the world of German sports cars. This is badge snobbery at its height and the underdog definitely gets ignored. Take Porsche, for example. When you see a Boxster or Cayman, the first thought is that the person driving it bought it because he or she couldn't afford a 911. It's not a bad guess, but there's more to it than that. There was another "poverty Porsche" in the 1960s. The 356 and the 911 overlapped briefly, but when the former went out of production in 1965, there was a gap for a cheaper, four-cylinder Porsche. Enter the 912, which looked like a 911 but didn't quack like one because it had the flat-four from the 356C. Still, it was like buying a 328i and telling your friends it's a 335i. While mildly successful, the 911 was always the Porsche people wanted and the 912 died a quiet death in 1969 just before the VW-Porsche hybrid 914 was launched. But in 1976, Porsche needed an entry-level car in North America, because the 914 was dead and the 924 wouldn't be on these shores until 1977. So Zuffenhausen took a 911S and swapped in a 2.0-liter VW flat-four. The result: More than 2,000 912Es for 1976, including the one seen here. This silver example looks pretty fetching, partly because it looks just like the handsome 911 from this period. A friend from high school's mom had a red one that snarled just like a boxer engine. But because it was a VW mill, a service didn't cost an arm and a leg. This is a pretty gleaming example of one, especially for 144,000 miles. And you've got exclusivity on your side and most people will never know it's not really a 911. Still, $20,000 is a lot for a four-cylinder Porsche. A little more money can buy something much newer, if not quite as handsome. The BMW Z3 and M coupes were shooting break versions of the roadsters. They looked odd but I wanted one when I was 10. I think far fewer people knew about (and wanted) the Z4 Coupe of just a few years ago. The first Z4 wasn't really a looker in my book and the hardtop was a bit of a dog, too. Someone told me it sort of looked like the Jaguar E-Type Hearse from Harold and Maude. But odd and German? That's rare and this week's theme. Now, you could get these cars in a number of great colors and with either a manual or automatic, so why someone went for Maalox White and the self-shifter is beyond me. But the caramel-colored seats and wood dash are kind of intriguing. I agree, the rear three-quarter angle is a bit challenging on this car, but from the side it looks great. And the hatch lends a bit of practicality. You can almost fit things back there. Because I doubt many of these were sold, I think it has the potential to be a future classic like the aforementioned 912. For my money, though, I'd skip the modern conveniences of the BMW and go for the Porsche. Yes, I'd have to explain why it says 912E on the back when it clearly looks like a 911. But it's a classic already, and maybe I can sell it when I find the M Coupe of my dreams. Because you never know when the ugly duckling on the new car market can turn into a collectable on eBay. What would it be for you guys? 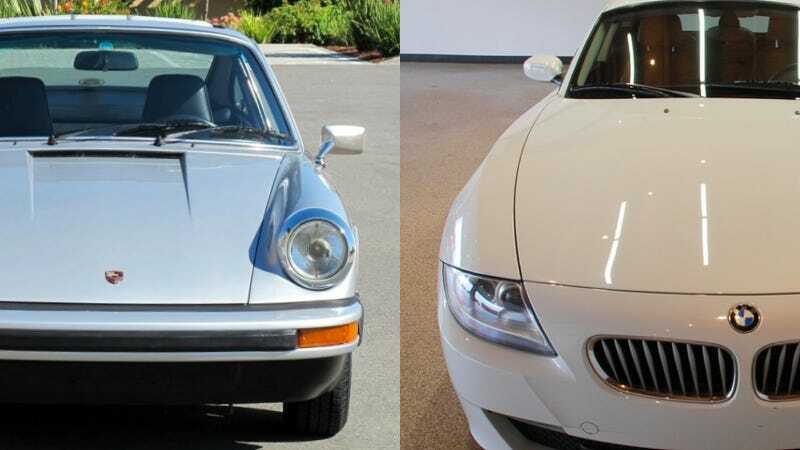 The old-school four-banger Porsche or one of BMW's more unfortunate looking endeavors? Let us know in the comments.